As I sit here I can hear the city and nature as well. In the bottom of the valley, slightly to the left, I can see the river flowing through the city. I feel the air float by and I can hear bird’s wings as they fly overhead. Yesterday was a wet day in contract to today’s sun, but the power of sitting here at the edge of the city right in the middle of the city is remarkable. It is as though the city just wants to tell me all about itself. When I first came upon this bench I stepped in front of it to enjoy the view and very briefly read the inscription placed on it. 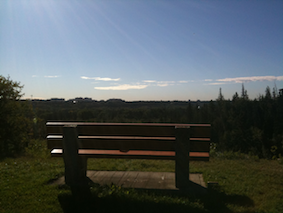 When I finished doing some morning stretching exercised (ITP Kata) and a little meditation on the edge of the bench, I sat in it and talked to myself. I sorted out that I needed to be able to write here, not just talk. I resolved to get a notebook a I stood up and prepared to leave. Then I realized that I had read the inscription on the bench incorrectly. Art is the expression of man’s delight in God’s work. Art is the expression of God’s delight in man’s work. The game my mind played with the words made this little message jump out at me. I have been musing about how I create the conditions for my creative self to flow freely. It may or may not be ‘art’ per se, but that doesn’t matter. It doesn’t matter if I believe in God, a higher power, a Spirit, a Creator or the creative Essence of my Self. These words are powerful. Art is the expression of our delight in the world. Art is the expression of our world’s delight in us. 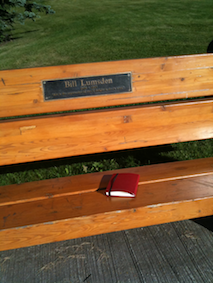 The words are attributed to Bill Lumsden, 1928-1997. I have neighbours with the surname Lumsden, and while I have no idea if they are related, I can’t imagine that they are not. I felt as though my very neighbourhood was speaking to me, asking me to look at things and look again. Take the meaning of something and see if there is even more meaning. And take great delight in what I find. And share what I find for your delight.